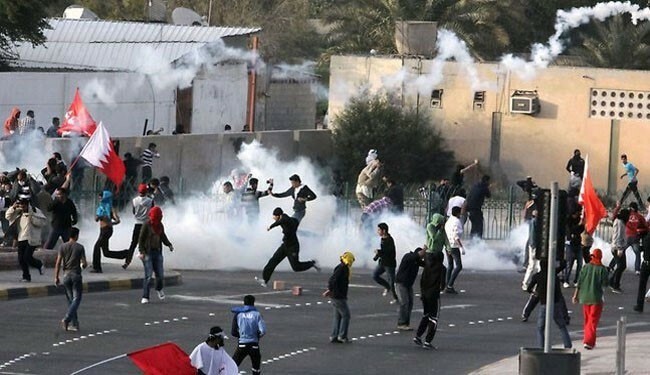 JNN 21 June 2014 Manama : Bahraini security forces have intensified their brutal crackdown on anti-regime protesters as police clash with demonstrators holding rallies in several villages in the island of Sitra near the capital Manama. The Bahraini regime’s Saudi-backed police forces fired rubber bullets and tear gas canisters Wednesday evening at crowds of protesters that were holding rallies against the persisting crackdown on anti-regime demonstrators. Similar protest rallies have also been held in the villages of Diraz and Samahij despite the brutal use of force by police. According to an AP report from Sitra, the Wednesday evening protest rallies began with cries of Allah-u-akbar (God is Great) from the rooftops for nearly 15 minutes as regime forces took hold of the streets below. “We are not afraid, but we are cautious because we know they came here to kill us,” said Mohammed Said, a 30-year-old from Sitra, pushing a supermarket cart packed with frozen chicken, bottled water, chickpeas and bread. As the clash unfolded, the report adds, residents tried to block police vehicles with makeshift barricades including metal tables, pieces of wood and even gym weights. The development comes amid growing calls on the international community to step up pressure on the Manama regime to put an end to its rights violations. Since mid-February 2011, thousands of protesters have held numerous demonstrations in the streets of Bahrain, calling on the Al Khalifa royal family to relinquish power. In March 2011, troops from Saudi Arabia and the United Arab Emirates were called in to help Manama quash the anti-regime protests. Scores of Bahrainis have been killed and hundreds of others injured and arrested in the ongoing crackdown on peaceful demonstrations. This entry was posted in Middle East and tagged Bahrain, brutal crackdown, capital manama, Crackdown, Forces, police forces, protest rallies, Shia Protest Rallies, Sitra. Bookmark the permalink.